Spinach is one of my hubby's favorite veggie. Spinach is also one wonderful nutritious veggie which can be used with any combo. 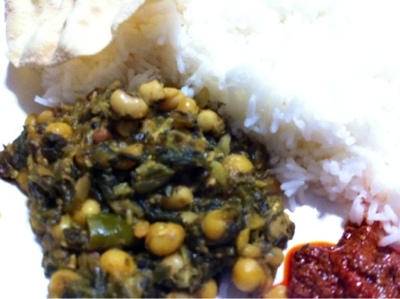 Here, I used soy beans and yellow peas along with spinach. This turned wonderful and delicious. I am also posting the nutritional content for soy, yellow peas and spinach. This curry can be had with rice/roti. 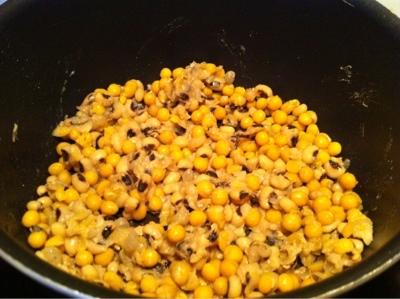 Soak Soybeans and yellow peas together for 6hrs and pressure cook them for 2 whistles. Drain water and keep aside. Do not throw the drained water. Heat oil in a pan and add cumin seeds and mustard seeds when they splatter add red chili and saute. Add onion, turmeric,green chili, curry leaf and cook till it is tender, meanwhile grind garlic, ginger and green chili together and add this mixture to onion. Close the pan with the lid, cook till the oil leaves the curry from sides. The add spinach and cook till it is well done. Mash cooked soy beans and yellow peas coarsely and add it to the spinach, also add 1/2 cup water (that is drained from beans) and mix well. Finally add red chili powder, tamarind extract, coriander powder and salt to taste and mix well. 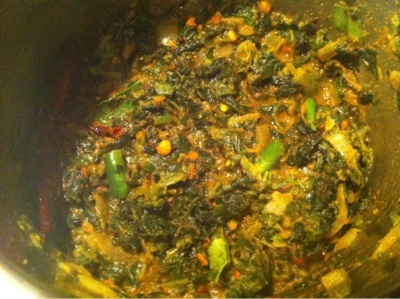 Check for taste and cook till the raw flavor from spinach goes away. Turn off the stove.